Analytics are rapdily being adopted by the insurance industry to harness the growing volumes of data being generated through enterprise business systems, online interactions, social media and other channels. Turning all of this data into useful information remains a challenge for most insurance firms. 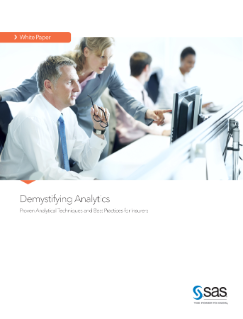 This white paper highlights some of the best practices and techniques that insurers can use to turn their data into valuable insights. Distribution optimisation. Get analytical insight into the predictive factors that maximise the performance of your multichannel distribution strategy.